Wild at Heart • Inks + Thread. I was introduced to the darling Maggie Pate by the equally lovely Beca of Tumbleweeds Handcraft a while back, and I have to admit I've got a big girl crush on her (on both of 'em actually)! Maggie just opened a new Etsy shop featuring beautiful scarves, one of which I just had to share. 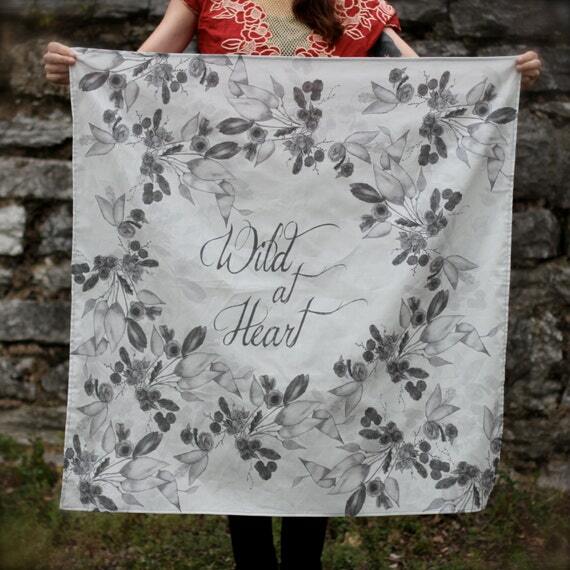 How perfect would this Wild at Heart scarf be for me? (My birthday is September 15th, in case you were wondering; and Frank, if you're reading this, our anniversary is coming up! ;)) Maggie says the scarf "is reminiscent of a delicate tattoo," which might be why I'm so drawn to it. Though I think the real reason is the "wild." A Wild Tonic, Wild at Heart? A match made in heaven, I think. Check out the whole shop and give Maggie a hello on Twitter if you'd like!